The term Aylesbury Duckling is misguidedly used by many people to describe all white table ducks; this is far from correct as the vast majority of ducks available are hybrid breeds. The exception is the exhibition or show Aylesbury which is still bred by enthusiasts. This duck is derived from the Aylesbury strain but is bred purely for show points, that is, length of neck, depth of keel etc; it is not as ours - the true Aylesbury table duckling. These birds would be kept separate from his own stock until he had hatched eggs from them, only then if he thought they were suitable would he incorporate them into his breeding régime. This would be done by crossing the ducks (females) with his own drakes (males) if the progeny was not up to expectation the whole batch would be discarded, he was a perfectionist. By having this large gene-pool and very careful breeding we have been able to continue to produce the REAL Aylesbury Duckling. From the time they are hatched our ducklings are reared inside for the first two weeks, then free-ranged for the remaining six weeks of their lives. They are killed at the age of 8 weeks; this is traditional as they change feather at 9-10 weeks so they then would be classed as ducks not duckling. The average oven ready weight of these ducklings 50 - 60 years ago would have been 5 1/2 – 6 lbs. We now can attain weights of up to 8 1/2 lbs (3.86 kgs) oven-ready. This is due to the almost perfect formulation of the feed ration we now use, and many years of careful breeding by the family (average oven-ready weight now being 6 1/2 - 7 1/2 lbs – (2.9 -3.21 kgs). 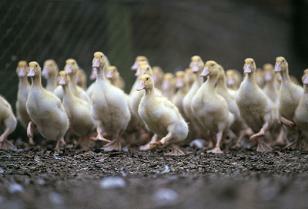 All of our ducklings are of course bred, hatched and reared by us on our farm, we also kill and process on the farm. They are fed on a ration made to order especially for us by Gro-Well Feeds of Melksham, Wiltshire which contains no growth promoters, or antibiotics and no meat or fish proteins; it is cereal-based with only the essential vitamins and minerals included.